1.Every child is a unique child, constantly learning and can be RESILIENT, CAPABLE, CONFIDENT and SELF ASSURED. 4.Children develop and learn in different ways and at different rates. I have highlighted in capitals the bits I believe the outdoors, in whatever form, can really bring something different to the party, beyond what a classroom can deliver. As four lines, even out of context, they make a lot of sense. Who wouldn’t want their daughter or son to fit into or at least identify with those statements? -Listens to stories with increasing attention and recall. phrases in rhymes and stories. The Early Years Practitioner will, through casual and planned observations note down when a child consistently carries out these characteristics or behaviours. This takes planning of course to create situations and mechanisms to initially provide the opportunity to first learn then develop and ultimately see that behavior consistently – “listens to stories…” is the obvious example. Some of that happens more naturally such as with toileting/personal care skills or the way a child eats. This format is repeated over each specific area and age range from birth to 60 months. It is a massive task each practitioner has with each child in their charge typically up to 10 children in a key group- theirs is not an easy job! Here are a few more, with extracts highlighted that I believe the outdoors lends itself to. This list is not even close to being definitive. Building a Zip line. Team work! making predictions, coordination, effort, following instructions, handling tools, why & how questions, turn taking, being brave, patience, maths (lengths of equipment, weight, faster or slower) and many more. 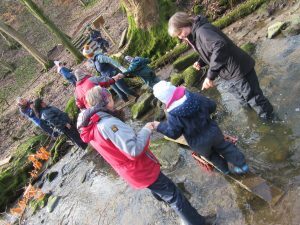 Where the outdoors and the odd adventurous activity fits in and my take on it particularly is it offers most children something new, different and outside their usual sphere of nursery and bright coloured plastic experience. This also provides the Early Years Professional the opportunity to focus on observing entirely natural behavior as the child reacts to me and the activity, it frees up the professional to make the observation, when usually they are delivering the activity and trying to observe at the same time, which is a tall order to do both to the high standard they would wish to. 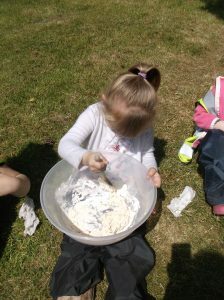 The children are involved in how that session pans out: the timing, the structure, the activity or task itself. Every session has a plan agreed in advance, but believe me every session is very different, as every child is unique and so each responds differently to the same stimulus, which then creates different reactions from me and the practitioners and teaching staff involved. It is astonishing how with one plan for each of the ten key worker groups in a nursery, all ten are unique. Even the simple act of reading a story outside in the sun or under canvass, or in a willow tunnel, perhaps having just experienced something the characters in the story have, takes on a different and deeper meaning to each child if we have just been balancing like Jess in “The Wild Woods” or helping Owl Mummy find her babies and build a nest (Owl Babies) or pitching a tent like Maisie in “Maisie Goes Camping”. Balancing different fruits on our heads like Handa in “Handa’s Surprise”. The list goes on. Making bread to cook on a fire, to then eat together. I am told after sessions that what we have achieved or created impacts on the children’s play back in nursery, there is frequently imaginative play reflecting what we have done or directly recreating it for several days and weeks afterward. Coupled with art work and drawings helping recall and further self expression (‘how did that make you feel?’) the opportunities for following up those outdoor sessions are full of potential themselves in meeting EYFS statements. 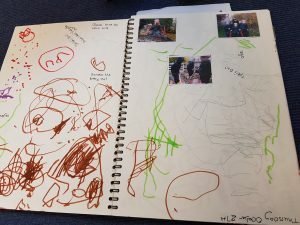 A ‘Floor book’ used to give space for children to draw what they did, or their favourite thing they saw that session along with the chance for the practitioner to write quotes down. Photos are added to begin discussion on ‘what we did last time’, the weather and so on. 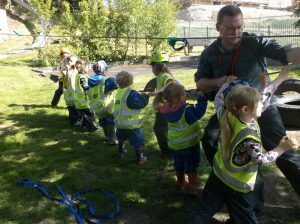 What I want to achieve with every early years session is to offer a range of activity which supports the child in their development through opportunity they may otherwise not get and offers the childcare professional the chance to view their charges in a different light and perhaps gives both some different experiences to broaden horizons. A note on being a bloke. It helps! In the Early Years world us chaps are thin on the ground. There is no getting away from the fact that being male in this environment is a little quirky and offers the children a very different approach and delivery to just about everything I ask of them. if nothing else it comes in a different tone! There is no conclusion there, it just is. A common question in these activities and one that every Head Teacher/Nursery Manager is keen to ask is one of risk. I will look at risk and most importantly managing risk in a further piece to follow. Part three shall be its name…. Previous Previous post: Early Years Outdoors Pt. 1 or (Why kids should play out more…).